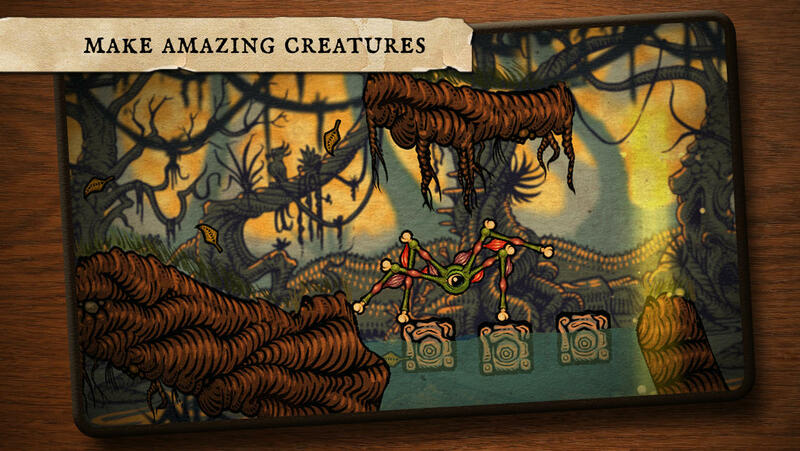 ‘Incredipede’ Review – This Physics Puzzler Has Legs. So Many Legs. Quozzle lacks most of what we might call heroic virtues. She hasn’t got a body, or even much of a face. She’s an eyeball, a few exposed bones and some scraps of flesh and muscle. A monster. But as the hero of Incredipede ($3.99), she has heart. She has tenacity. She has everything you give her. She might not look like a hero, but she’ll have you feeling like one. Colin and Sarah Northway’s Incredipede is a physics game that borders on the horrific. It also borders two genres: in its Normal mode, you platform about with the creatures its creators wrangle Quozzle into being, creatures of limbs and joints and too many feet. In its Hard mode, you traverse the game’s levels without their help: you give Quozzle form, and then you get her to the finish line. Released on desktop last year, Incredipede survives the transition to mobile pretty much wholesale. It has all 120 levels across the two modes. It has a level creator and browser. It has the same lush illustrative style as the desktop version, and most of its graphical charm. The interface can be slightly claustrophobic on smaller devices, but on the whole it translates remarkable well. Incredipede has picked up a bevy of on-screen controls in the process, one for each muscle group you can control. These are perfectly comfortable to use, insofar as playing this game can be considered comfortable. Sometimes it’s a bit like playing QWOP, and each tap of a button leaves you praying not to topple backwards or collapse to the ground. This too is perfectly translated from desktop. You can fail just as effectively at the basics of movement. Controlling Quozzle rarely feels glorious. 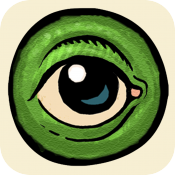 She is an early evolution of cyclopean creatures—no matter how many limbs you stick on her, how complicated your muscle groups, she never leaves behind that little eyeball-critter crawling from the ocean. Make her tiny or huge, give her horrific biological wheels or a dozen spidery legs—her life will always be a struggle. It’s usually the good kind of struggle, though. Sure, Incredipede can be agonizing. Some levels see you wiggling Quozzle’s little limbs back and forth with the lightest touch and praying it ends your way. Others are agonizing in another way, as you build her up then let her limbs burn off and her big eye wince in pain. All that matters is that she survives to the finish line, though. Survives, and collects whatever collectable will help open the world’s gate and bring her closer to her goals. Sometimes you get to soar, though. Sometimes you build the perfect body and send her through unscathed. You might make due with a spare few limbs and muscles, but why not build something amazing? 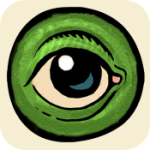 Incredipede gives you that freedom, and then lets you share your piecemeal monsters with the world. The level design doesn’t always reward this creativity, but it almost always allows for it. And who says the fastest route is always the best? Quozzle doesn’t need any evolutionary advantages. She just needs enough limbs to get moving. There might be something inherently disturbing about Incredipede and its little hero, with all her muscled limbs and boney feet, but that’s easy to forget. She’s a charmer, that one, with her expressive eye and tenacious will. And like its hero, Incredipede charms. Behind every frustration is a challenge to be solved—better, faster, or with infinitely more limbs. It’s a small scale for playing God, but creation sure is fun.